What is included with your Handcrafted Log Home Package? When a Handcrafted Log Home shell quote is provided, what is included? What are your log sizes for handcrafted log homes? What log sizes to you offer for machine cut log homes? What log species do you offer? What is included with Post and Beam Home Packages and Heavy Timber Frame Homes? What is included with Milled Log Home Packages? For Machine Cut Log Homes what log profiles do you offer? Is Scandinavian Full Scribe or the Chinking Method better? 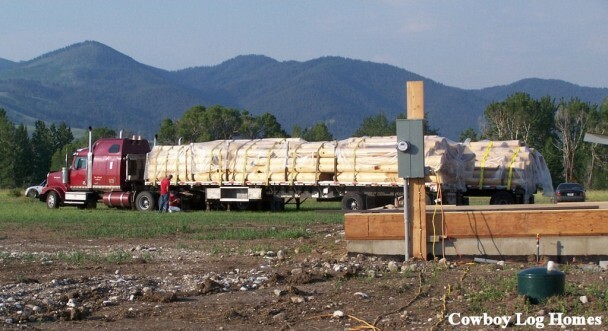 What is the lead time before a log home package is shipped? Can changes be made to floor plans? What payment schedule do you require? How much are the log packages per square foot? How is the wiring installed in a log home? Question: What is included with your Handcrafted Log Home Package? Answer: When we provide a quote for a Handcrafted Log Home we begin with the log shell. The log shell encompasses the superstructure of the home. Specifically: stacked wall logs, log roof system, handcrafted log trusses, floor joists, and interior log staircase first floor to upper and log assembly hardware. We also are able to provide a complete dry-in package including materials such as exterior doors, windows, 1×6 Pine or Cedar tongue and groove, and roofing material. It is totally up to the customer to choose exactly what they would like us to include for their specific project. Question: When a Handcrafted Log Home shell quote is provided, what is included? Answer: All of our log shells are entirely pre-cut and pre-numbered. 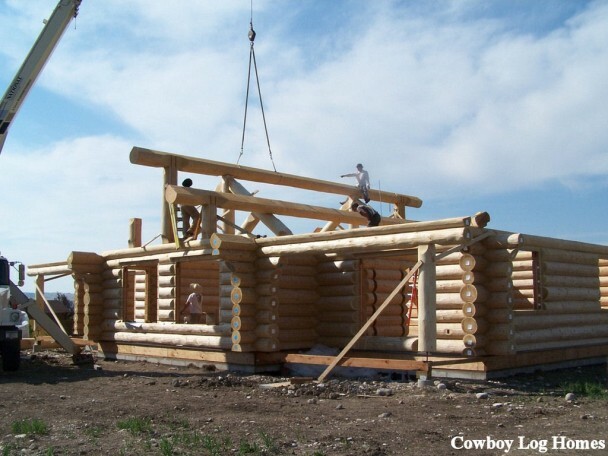 Question: What are your log sizes for handcrafted log homes? Answer: For Handcrafted Log Homes our wall logs range between approximately 12 and 16 inches in diameter and up to 50′ in length. Logs used to support roofs and floors range between approximately 14 and 20 inches. Larger sizes can be upgraded to upon request. Question: What log sizes to you offer for machine cut log homes? Answer: Our Milled Logs sizes for Swedish Cope include: 7, 8, 9, 10 and 12 inch diameter. The Milled Log sizes for double tongue and groove stacked homes include 6×8 , 8×8, 4×8, 6×12, and 8×12. Other log sizes may be available upon request. Question: What log species do you offer? Answer: We offer Western Red Cedar, White Pine, Red Pine, Lodge Pole Pine with bluing, Engelmann Spruce, Western Larch, and Douglas Fir. Question: What is included with Post and Beam Home Packages and Heavy Timber Frame Homes? Answer: Our Post and Beam home packages include the superstructure of the home. The superstructure is the ‘skeleton’ of the home made up of the vertical posts and horizontal beams, roof system, staircase, railing, etc. Post and Beam and Timber Frame homes all use the traditional joinery of mortise and tenon, dovetails, etc. Also the materials required to dry it in can be included upon request. Question: What is included with Milled Log Home Packages? Answer: Our milled log home packages basically include the same things that our Handcrafted Log Packages with the exception of the first floor subfloor. We do include the first floor sub-floor with our machine cut packages. Question: For Machine Cut Log Homes what log profiles do you offer? Answer: Our machine cut logs come in either Swedish Cope; D-log (round on the exterior, flat on inside); Double D (round on interior and exterior of home); square log (flat on both sides). Question: What areas do you service? Answer: We work with customers all over the United States and Canada. Overseas shipment is also available. Log homes can be found world wide. Question: Is Scandinavian Full Scribe or the Chinking Method better? Answer: Both the Scandinavian Full Scribe Method and the Chinking Style also has a strong presence in the history of log homes. The Full Scribe method has each log scribed to fit together. The underside of each log has a V shaped channel and is custom fitted to the log under it. Chinking Style homes are designed with channels left between each row of logs for the chinking. Chinking channels can be wide or narrow, depending on the style the owners want. The chinking available today has elasticity so that it adheres to the logs well. Question: What is the lead time before a log home package is shipped? Answer: For Handcrafted Log Homes, Post and Beam, and Timber Frame please allow approximately 10- 14 weeks from initial deposit until delivery of your home. (Rush Orders Possible ~ Please call 406-388-3458 to check availability in our yard). Question: Can changes be made to floor plans? Answer: Yes! Any floor plan can be modified in anyway that you would like. Actually, about 95% of homes we sell are custom designs. 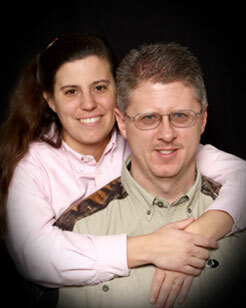 Our services include modifying an existing plan or a fully custom design. Question: What payment schedule do you require? Answer: When a log shell is being purchased we typically require a 30% deposit with the signing of the log shell contract. This locks in your prices, secures your log materials, and the drawings are finalized. Then a second payment of 40% is due when the logs are pre-built in log yard to five (5) rounds up. The final 30% of the log shell is due two weeks prior to scheduled load date. Please call for details on full dryin package payment schedule. Question: How much are the log packages per square foot? Answer: For a handcrafted log home we are seeing about $45 to $60 per square foot. For an 8” milled log home the log shells typically range between about $24 and $28 per square foot. Once a floor plan is selected we are happy to provide a complimentary price quote estimate based on your floor plan. Some variables which do innately make a log home more expensive are design features such as complexity of roof lines, variations in foot print of the home, upgrading to larger log sizes, the use of Western Red Cedar, inclusion of Flared Character Posts and wall logs, extensive covered porches, balconies, and log gazebos. Question: Are your logs graded? Answer: Only the best materials are incorporated into our homes. All logs are Premium. TPI (Timber Products Inspection) grade stamping is available upon request. For logs to receive a TPI grade stamp and independent inspector visits the yard and physically inspects each log to be used for your home. The a grade stamp is applied. Question: How is the wiring installed in a log home? 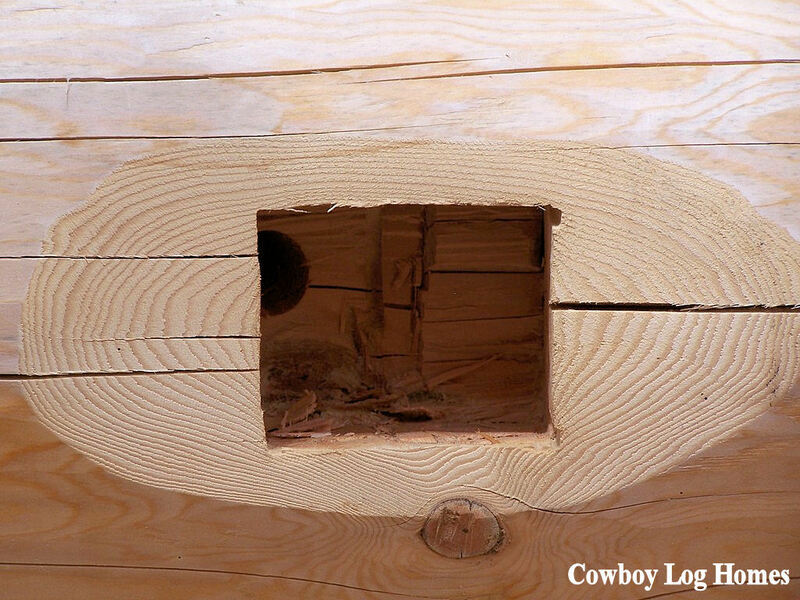 Answer: For both Handcrafted Log Homes we pre-cut and pre-drill all wire box holes and wire holes into the logs during the crafting/manufacturing process. Also the logs are recessed to receive switch plate and outlet box covers. For Milled Log Homes the electric boxes holes and wire holes are installed on the job site by the builder. Answer: We do our best to minimize shipping costs for the owners. We are happy to provide as much dry-in materials as the customer desires. At times it may be more economical to get some dry-in materials locally. When ordering the home of your dreams shipping is a very small percentage of the entire cost of your home. Shipping is a direct cost paid by the homeowner to the trucking company. We take care of processing all shipping papers, arrange for shipment, and loads trucks at no charge.